This project is going to be an on-going job, which we are going to do in stages. This is as requested by our client and will also allow us to fit it in with our busy work scedule. 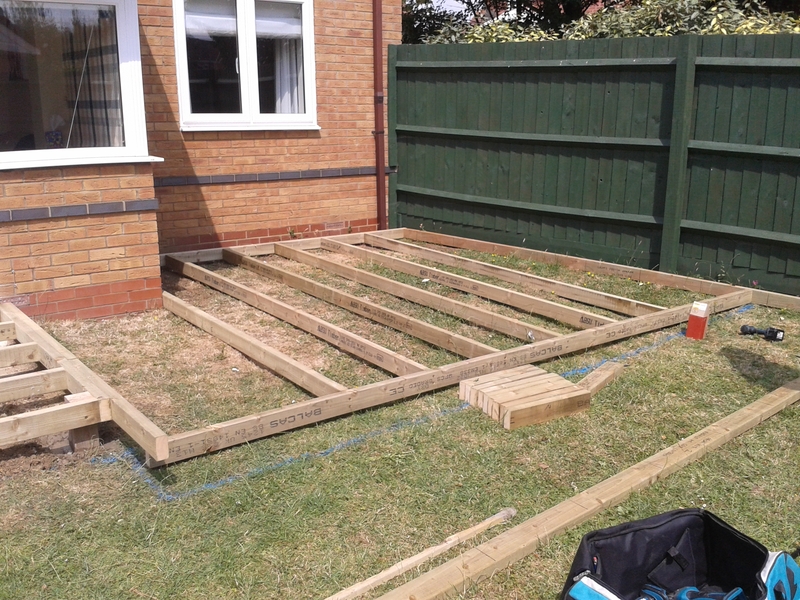 We started by laying the framework for the decking near the house. We decided that because of the angles involved it would be best to treat it as two separate decks to start with. We constructed the frameworks as you can see above, the smaller area at the patio doors is approx 2m x 2m and this will join to the bigger area of approx 4.5m x 3.6m. These will then merge into one large decked area. The next job is another 3m x3m decked area with a pergola constructed over it, this is going at the other end of the garden. We intend to lay this framework and then we can lay the weed suppressing fabric to all the decked areas at the same time. We can then proceed with the laying of the deck boards and the construction of the pergola. We have allowed 2 people 4 days for this stage of the job.